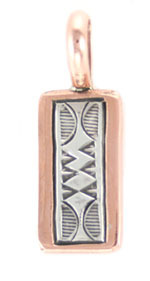 This pendant is made out of copper with a strip of stamped sterling silver going down the center. It measures approximately 1 3/8" long by 1/2" wide. Stamping will vary. Crafted by Navajo artisan Wylie Secatero.